Looking for a creative wedding word scramble for an upcoming wedding shower? You can't go wrong with the word games here because they're fun, free, and printable! Our free, printable wedding shower games are different from the others you'll find online. We write all of our own material. Why not print and play these games yourself, then share them with your guests? Try these wedding-related scramble words for a quick warm-up. Then check out our lists of printable word scramble games below. Bridal Shower Honeymoon Scramble: What does every bride need to take with her on the Honeymoon? Unscramble these fun words to find out. 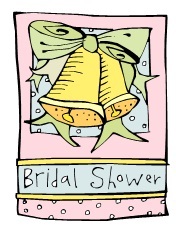 Bridal Word Scramble: This game is sure to be a hit at your next shower. Your guests will unscramble 15 wedding-related words to discover a hidden word. Wedding Word Scramble - Kitchen Appliances: How handy is the new bride in the kitchen, and how skillful are your guests with this tricky puzzle? Spice It Up! : Can your guests unscramble this list of 20 spices and seasonings? Even if their spice racks are well-stocked, your guests may be challenged to complete this fun wedding shower game! Triangulair Scramble Word Games Can you beat our scores on this challenging, unique word scramble? 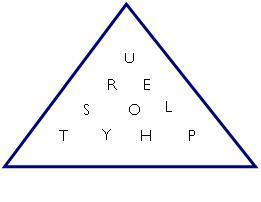 Make words of four letters, and one ten-letter word from the letters in each triangle. Fun! Parts of Baby's Body - A printable, simple word scramble for your next baby shower. A to Z Baby Name Scramble - This on is a challenging word game based on babies' first names. Tons of fun! Oxymoron Scramble: Here's an unusual word play scramble. Discover 20 goofy sayings we use that don't really make much sense. Books of the Bible Word Scramble People of all ages will enjoy this Bible game with a twist! Great for family night or Bible classes.